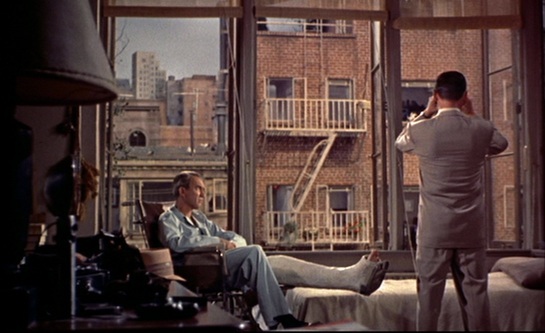 In Rear Window, the classic Hitchcock thriller, photojournalist L.B Jeffries (James Stewart) is confined to a wheelchair and his apartment by a broken leg. To pass the time between visits from his nurse Stella (Thelma Ritter) and his girlfriend Lisa (Grace Kelly) he observes his neighbors in the other apartments around the courtyard through his rear window. He soon becomes convinced one of them has committed a murder. But how can he prove it? – The original story by Cornell Woolrich had no love story and no additional neighbors for L.B Jeffries to spy on, those elements were created for the film. Writer John Michael Hayes was encouraged by Alfred Hitchcock to spend time with Grace Kelly before writing the Lisa character and therefore some elements of Lisa were inspired by Grace. – The film was shot on one set, which was built specifically for Rear Window. The apartment-courtyard set measured 98 feet wide, 185 feet long and 40 feet high and it consisted of 31 apartments. – Rear Window is the only film in which Grace Kelly is seen with a cigarette. She refused to smoke in films, except this one. – It is said that the relationship between photographer Robert Capa and actress Ingrid Bergman was Alfred Hitchcock’s inspiration for the film’s romantic plotline. – The camera angles are largely from the protagonist’s, L.B Jeffries’, own apartment, so that the film viewer sees the inhabitants of the other apartments almost entirely from his point of view. This way, the audience shares his voyeuristic surveillance. – All the apartments in Thorwalds building had electricity and running water. During the month-long shoot Georgine Darcy, who played Miss Torso, practically lived in her apartment all day, relaxing there between takes as if she were at home. – One thousand arc lights were used to simulate sunlight. Once during filming, the lights were so hot that they set off the soundstage sprinkler system. – Alfred Hitchcock bought back the rights to Rear Window and left it in his daughter’s possession after his death. 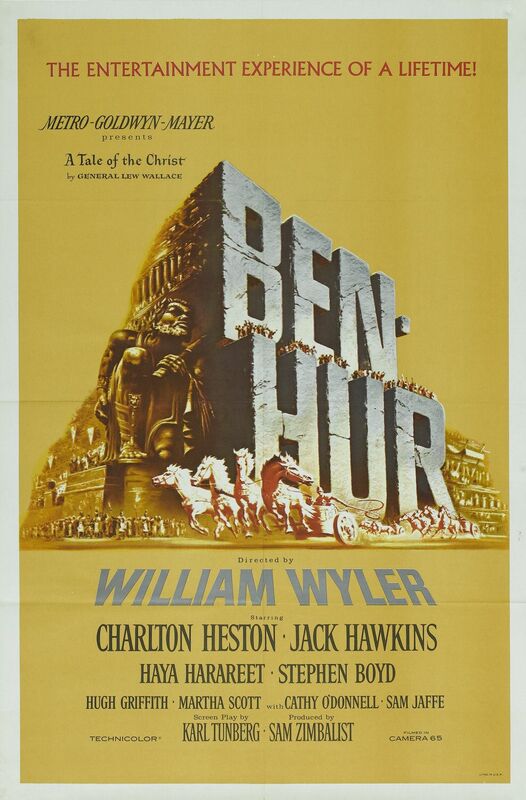 Because of this, the film was unavailable for decades, along with four others: The Man Who Knew Too Much, Vertigo, Rope and The Trouble With Harry. Together they were known as ‘The Five Lost Hitchcock’s’. They were re-released in theatres around 1984 after a 30 year absence. – The film negative was damaged as a result of natural color dye fading as early as the 1960’s. Despite fears the film had been irrevocably damaged, preservation experts were able to restore the film nearly to its original coloration. – As usual Alfred Hitchcock had a tiny cameo in his own film: about a half hour into the film, he is seen winding the clock in the songwriter’s apartment. Alfred Hitchcock is known as one of the greatest directors and producers in history. His nickname was ‘The Master of Suspense’ and he lives up to that nickname with his work on Rear Window. 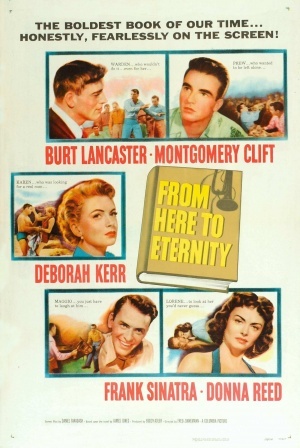 The film could have easily been boring, as the whole movie is played out in the same room, but Hitchcock made it a thriller full of suspense. You feel the protagonist’s frustration and the film builds up to a satisfying climax. 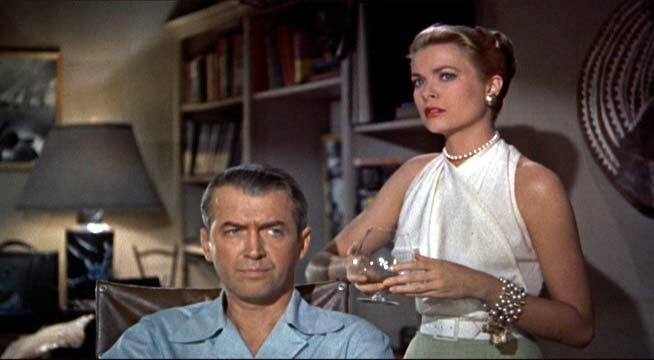 Rear Window is not only one of the greatest films in Classic Hollywood history, it also features two of its greatest stars: James Stewart and Grace Kelly. The two are perfectly cast and are very believable as a couple. 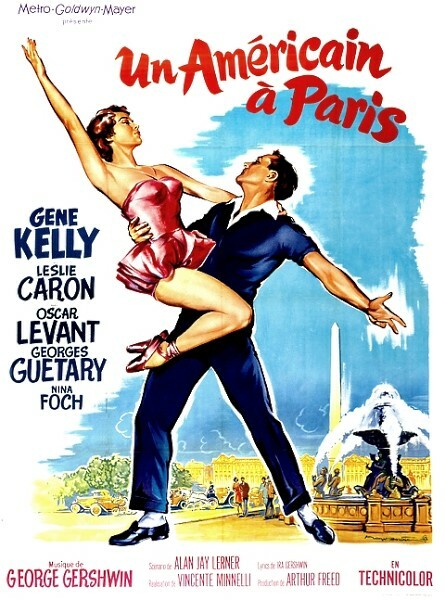 It is obvious that they are comfortable under Hitchcock’s direction and we can see why Grace Kelly was one of his muses. 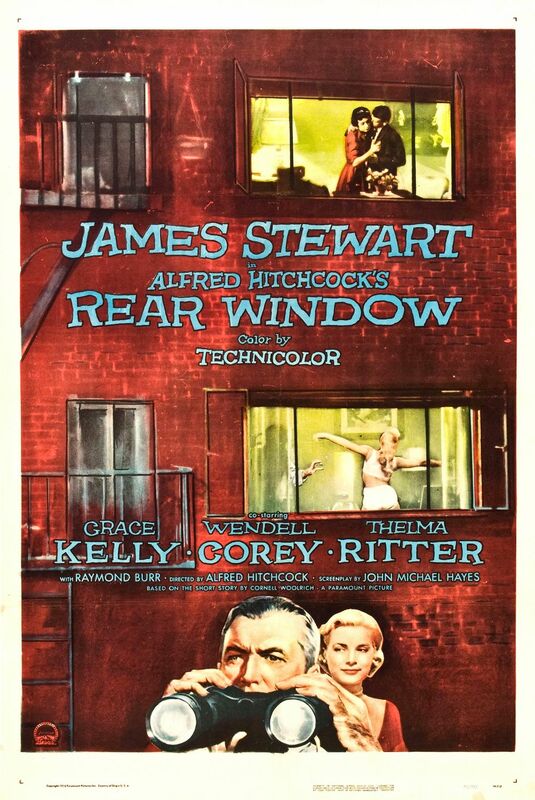 In today’s pop culture Rear Window is still repeatedly re-told, parodied or referenced, which proves its significance to this day. Read more about James Stewart or Grace Kelly’s life. I just discovered this site and it’s FABULOUS – thank you for all of your excellent work!